Hawks guard Kyle Korver needed only 10 attempts to nail a season-high eight three-pointers on Wednesday against the Kings. A few weeks ago, Korver broke the NBA record for most consecutive games played with at least one three-pointer made (90), an honor that Larry Bird or Reggie Miller never really approached in their respective primes. On this night, however, Korver garners only local acclaim for an equally prodigious feat — notching a season-high in three-pointers made (eight), with the final long-range bucket boosting the Hawks’ lead to 15 and clinching their 14th victory of the season. Kings head coach Mike Malone wasn’t too pleased with his team’s defensive focus, particularly involving Korver. "I guess I’m not doing good enough of a job to give our players a game plan that they can execute … and not doing a good enough job explaining the (Hawks players0 who make shots. …"
Malone later added: "We’re one of the worst defensive teams in the NBA … I have to do a much better job in teaching our defense, teaching our coverages, because right now, the message is not being received â and that’s one me." 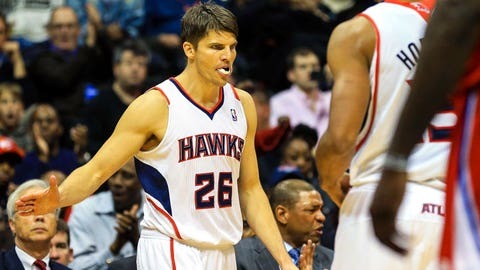 Just like snowflakes in January, none of Korver’s eight triples were truly alike. The long-range makes came off high screens, flash cuts to the middle, fast-break opportunities and even half-court kickouts after an offensive rebound. "I got a lot of really good looks tonight — I usually don’t get that many," said Korver in the post-game media scrum. "That was a product of a lot of (offensive) spacing and everyone knocking down shots." Hawks head coach Mike Budenholzer echoed the sentiments of his sharpshooter, saying, "For him to get a (clean three), the ball has to move and it has to find him on target. That’s been area of emphasis for us." Korver was extremely proficient against the Kings, as well, needing only 10 triple tries to reach his seasonal summit, to date. It’s a subjective process, comparing one quarter to another over the course of two months. But you’d be hard-pressed to brainstorm a more prolific stanza from November or December, with Atlanta subtly transforming a two-point deficit into a 17-point runaway victory. The fun started innocently, perhaps surprisingly, with reserve forward Mike Scott (10 points, three assists) burying just his 11th triple of the season. Roughly 77 seconds later, Scott nailed another shot from beyond the arc, giving the Hawks a lead (95-93) they wouldn’t relinquish for the rest of the night. Next up, Shelvin Mack (six points) scored an easy layup for Atlanta, setting the table for another Korver flurry — highlighted by two three-pointers from 24 feet and beyond … and one ho-hum jumper of merely 11 feet. A few minutes later, with the Hawks holding a 109-100 lead, and the Kings still hanging on, Atlanta collected points on eight straight possessions — a run that included a Scott layup (thanks to an offensive rebound), four Al Horford jumpers from mid-range, four cumulative free throws from Jeff Teague and DeMarre Carroll … and of course, the obligatory bomb from Korver. All told, Korver (28 points), Horford (25 points, 10 rebounds) and Teague (18 points, 15 assists, eight rebounds) enjoyed robust nights on the stat sheet, while leading the charge throughout Atlanta’s evening of hot shooting (57 percent from the field) and peak efficiency on the court (five players with plus-minus ratios of 14 or higher). "I was just getting the ball to the guys who needed (it)," said Teague, who has notched 38 assists in his last four games (three victories). Most telling sequence of the night: Here’s tiny window into the current fortunes of the Hawks and Kings. With Atlanta holding a 39-35 lead in the second quarter, Kings guard Jimmer Fredette grabbed a defensive rebound, dribbled the length of the court, attacked the baseline and then dished the ball to Travis Outlaw, who proceeded to brick his three-point attempt against the side of the backboard. Horford grabbed the errant shot and then flung the ball to Korver, who buried a triple … before some Kings defenders could even cross halfcourt. The Kings relocated to northern California 28 years ago; and in that span, the franchise has enjoyed only seven campaigns of 40-plus wins (1999-2006). That’s a long time to mire in mediocrity, or worse, toil in anonymity, especially when often holding premium draft picks over the last four decades. But this isn’t the time to lament the Kings’ long-standing foibles; instead, it’s a good opportunity to acknowledge the glimmers of hope that illuminate DeMarcus Cousins (28 points, seven rebounds, six assists), Derrick Williams (the No. 2 overall pick two-plus years ago), rookie Ben McLemore (10 points, five rebounds) and point guard Isaiah Thomas (20 points, 10 assists). After that, it’s hard to predict the club’s next series of moves, especially since Rudy Gay (22 points) and Marcus Thornton come off the books after next season. Of course, there are benefits to being 7-18 and owning the Western Conference’s second-worst record: With a new head coach (Malone), new GM (Pete D’Alessandro), new deep-pocketed owner (Vivek Ranadive) and a great shot at a high pick in next year’s star-studded draft, Sacramento can afford to invoke yet another wait-and-see approach to roster construction. Wednesday’s outing with Sacramento kick-started a seven-game run of six opponents (Kings, Jazz, Cavs, Bobcats, Magic, Celtics) with losing records, closing out the 2013 portion of the schedule. That’s six viable opportunities for the Hawks (14-12) to pad their record and maintain the quirky distinction of being only one of three winning clubs in the Eastern Conference — along with the Heat and Pacers. Quirky serves as a diplomatic term here, since a number of Eastern teams (most notably the Knicks, Bulls, Nets, Pistons and Cavaliers) have fallen short of expectations, with varying degrees of disappointment, of course. The Celtics, by the way, wouldn’t constitute as a disappointment at this juncture. For starters, Boston (12-14) holds a narrow edge over Toronto in the Atlantic Division; and back in October, the Celtics were widely hailed as, uh, contenders for the NBA’s worst record by year’s end. As in Boston would figure prominently in the race for the No. 1 pick in the lottery drawing — the much-anticipated precursor to an NBA draft that could feature 7-10 franchise game-changers.